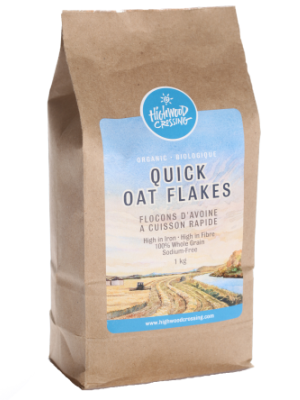 Our Organic Steel-Cut Oats are high in iron, a high source of fibre, and are sodium-free. They are certified organic and non-GMO. 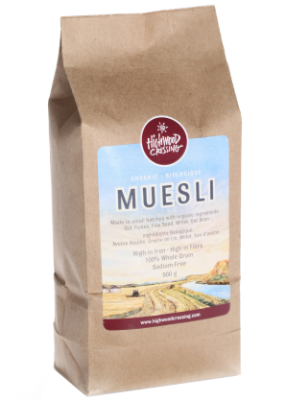 Processed in a nut and peanut free environment with no traces of soy or dairy. Milled at an oat-only facility. 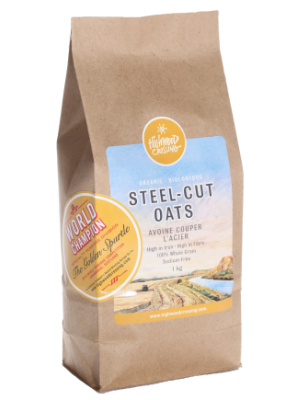 Steel-cut oats are de-hulled whole oat groats that are cut into small chunks with steel blades… hence “steel-cut”. 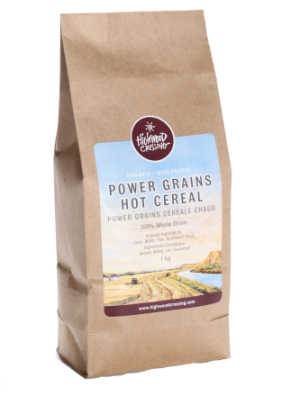 Although steel-cut oats take longer to cook than rolled oats, you are rewarded with a thicker, heartier, chewier, more nuttier tasting bowl of goodness. As with porridge made with rolled oats, the variations of steel-cut oats are limited only by your creativity. Common toppings are fruit, ground flax, brown sugar, or maple syrup. Directions: Stir 1 cup of Steel-Cut Oats into 3 or 4 cups of boiling water. Cook and stir on low for 10 to 20 minutes. Serves 3 to 4. And in a major surprise to the Scots, a food writer from Alberta won the specialty division with a porridge called Canadian Cranberry Apple Crunch. Catherine Caldwell used Organic Steel-Cut Oats made by Highwood Crossing Foods. Owners Penny and Tony Marshall couldn’t have been more thrilled. “We would like to congratulate Catherine on the well deserved victory, and thank her for the ongoing confidence that she places in our products, ” Tony told West Magazine.